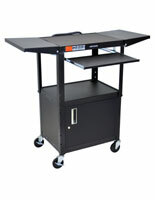 This Media Cart on Wheels is Ideal for an Office Equipment Trolley. This Display is Ready to Ship! This Media Cart on Wheels has 4 Rolling Wheels. Constructed of black powder coated steel for a sleek and durable tv cart that will last. (4) 4" swivel caster wheels (two locking) for easy mobility and sturdy locking option. Security drawer keeps items safe and can be pulled out from the front or back depending on presentation needs. Locking security cabinet with ample space to lock up expensive media equipment. 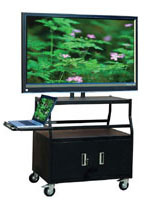 This media cart on wheels that holds flat screens up to 37" in size is great for classroom presentations in which a large tv is needed. 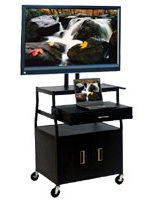 This tv display is ideal for classrooms or offices as a durable lasting presentation trolley. 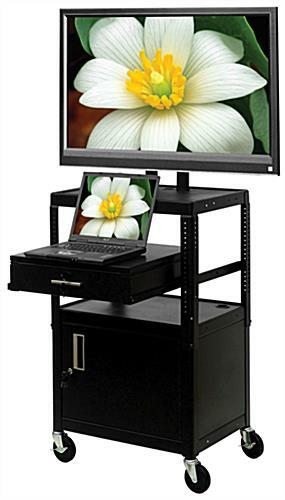 This mobile shelf unit, media cart on wheels that is height adjustable is versatile and allows users to choose the right height for presentation needs. The height adjustments range from 26"h to 42"h in 4" increments. 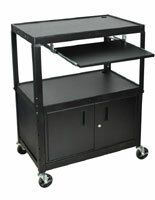 This black finish media cart on wheels is sleek and has a clean look to fit in with nearly any environment. The slide out drawer can hold a laptop or other items. This media cart on wheels utilizes security screws on the tv mount to keep television more secure. This shelf unit has a 24"w x 18"d surface for placing presentation items or more AV equipment such as speakers. This media cart on wheels can be easily pushed or pulled around a room or even to other rooms in an establishment. 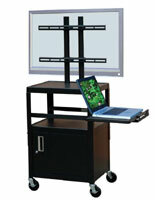 This tv mounting trolley eliminates the need for bulky outdated televisions used for classroom presentation. This media cart on wheels is an updated fixture. This mobile workstation has 4 swivel wheels, two of which are locking to keep in place. 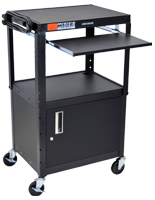 This mobile media cart on wheels, also known as a shelf trolley, has a security drawer that pulls out from the front or back. This allows users to keep other equipment such as a laptop or dvd player hidden in the back during a presentation. This media cart on wheels that has a security cabinet and drawer gives ample storage space for expensive equipment. This tv mounting shelf cart ships unassembled to save on shipping costs. There are many styles available in this online catalog to suit nearly every need! Manufacturer model# FDCAB4226E.